Wedding band Rome Italy - Hire your wedding music band in Rome! Wedding Band Rome Italy – Hire your wedding music band in Rome! – Why get married in Rome? – What’s included on our standard package? Wedding Band Rome Italy – Why get married in Rome? Rome is the perfect place for a magical wedding, during the last years we’ve played in many wedding venues in and around Rome and to this day we frequently play here!!! This is Rome, the “Eternal City”, the cradle of occidental civilization and Christian culture, the Italian capital, the Capital, Caput Mundi, the navel of the world, all roads lead to it!!! It is virtually impossible to make a to-do list…So many things to see!!! The Colosseum, where the gladiator games took place; via dei Fori Imperiali, a unique set of temples, basilicas, public and sacred buildings and the Roman Forum standing out of the surrounding lush vegetation; the famous Mouth of Truth, a marble carving representing the face of a faun near the Church of Santa Maria in Cosmedin; this mouth, according to legend, swallows the hands of liars (so it’s vey funny to take a picture there to capture the moment when the spouses make an oath of eternal and undying love). The tour of the city continues following the banks of the Tiber to Castel Sant’Angelo, a mausoleum for the Emperor Hadrian, a shelter for popes and a prison; the famous Piazza San Pietro, with the 16th-Century colonnade by Bernini and the magnificent Sistine Chapel, with its precious Last Judgement, another 16th-Century masterpiece, this time by Michelangelo…. Piazza di Spagna with the famous Spanish steps of Trinità dei Monti, Piazza Farnese and Piazza Navona with Bernini’s Fountain of the Four Rivers, not to mention the 18th-Century Trevi Fountain, where tourists throw coins and express their wishes. Via Veneto, the backdrop to Fellini’s La Dolce Vita and the symbol – with its trendy cafés and restaurants – of a decade that made modern history; and last but not least, the big four Roman shopping streets – Via Condotti, Via Frattina, Via Borgognona and Via Margutta – offer the best of Italian and international Made in Italy fashions. The best music entertainment for your wedding in Rome – “Guty & Simone” Rome wedding band. Our Wedding band Rome Italy is the perfect backdrop for the most important moments of your life: church wedding, civil wedding, wedding reception, wedding cocktail hour, wedding party and so on; we have more than twenty years experience as professional musicians, and for more than ten years we have specialised in wedding music for foreign couples getting married in Italy. We work an average of 40/60 events per year. We have a high understanding of spoken and written English. 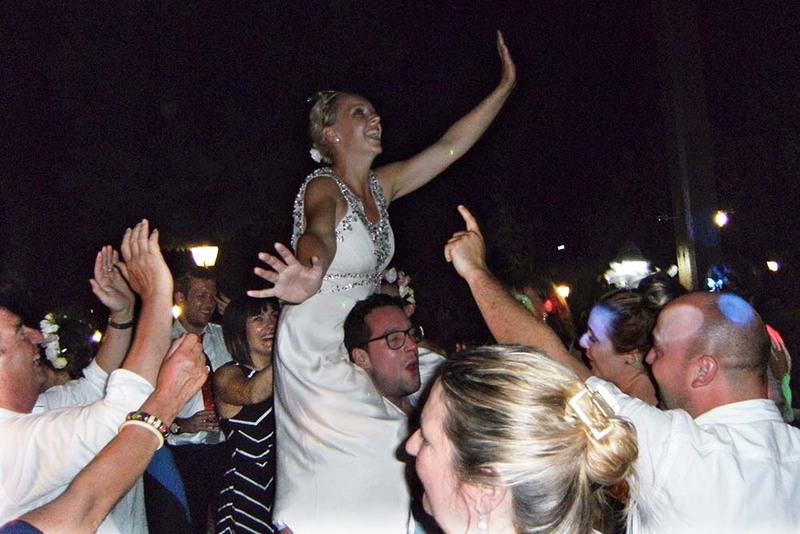 Our Rome Wedding Band work full-time on the musical elements for each event and are constantly in contact with the bride and groom as well as with the wedding planners in order to meet the clients’ every wish and need and to not leave anything to chance. Our Wedding band Rome Italy is not only a music band, it is a full sound design for events. Guty & Simone the Rome Wedding Band have a vast repertoire which covers all musical genres from the 50’s to present day including: Italian and International Pop, 70’s-80’s Disco, Latin, Rhythm and Blues, Ratpack/Swing, Rock, Reggae, Country and Folk etc. Our Wedding band Rome Italy can also accept DJ requests on-the-fly since we can access the web through our own Internet connection!!! In addition to the standard package our Wedding band Rome Italy can also organize the entire music entertainment for your wedding in Tuscany. – Wedding band Rome Italy can provide also SIAE music tax for wedding info and payment ONLINE. We love being part of your wedding!! Our Wedding band Rome Italy will make your big day an unforgettable and unique moment!!! If you’re looking for something special for your Wedding we can help you!! Video playlist 3: Hotel Majestic Wedding in Rome centre via Veneto – Wedding music band in Rome.